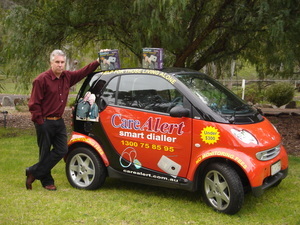 CareAlert is a registered business of Safety Electrical Services Pty Ltd. This company is owned and operated by Mike Steele who is well known around Australia for the 20 years in which he promoted the Clipsal Safety Switch. Known as the 'Safety Switch King', Mike regularly appeared for many years on TV, including Good Morning Australia with Bert Newton and was one of the originators in the early 80's of the TV infomercials. His commitment to family safety and operating a responsible and professional business assisted him to help convince the various State Governments around Australia to make Safety Switches compulsory in all new homes. In fact, the term 'Safety Switch' was pioneered by Mike in 1984. Since then the company has been instrumental in having well over one million Safety Switches installed into homes across Australia and as a result, many lives have been saved. A legacy that Mike is very proud of. With Mike Steele at the head of Safety Electrical Services, they enjoyed over 20 years of successful business and were rewarded with a number of awards, including the coveted Australia Day business award. In 2003, Mike decided to wind down the everyday operations of Safety Electrical Services and move towards semi-retirement. However, it wasn't long before he was looking for another challenge in the field of Safety and Security. In seeking for a suitable product to assist his aging mum to feel more confident at home and give her peace of mind, Mike found that most emergency diallers were initially too expensive and had extra on-going costs attached to them, such as monitoring fees. Not satisfied with the existing products available, he set about designing his own, which would suit the needs of the Australian community but without the high price tag and on-going fees. Enter - CareAlert, the Smart Dialler that not only gives real peace of mind but also saves you money. To continue the work begun Mike then set about making the CareAlert Dialler user-friendly and very easy and completely safe to order over the internet. Since its release, the CareAlert Smart Dialler is offering many thousands of people real peace of mind without the high price. It is also being recommended and used by many private and Government carer agencies, including hospitals and retirement villages.